Today we are going to review today Asus ZenBook Flip S (UX370) 2-In-1 convertible laptop. 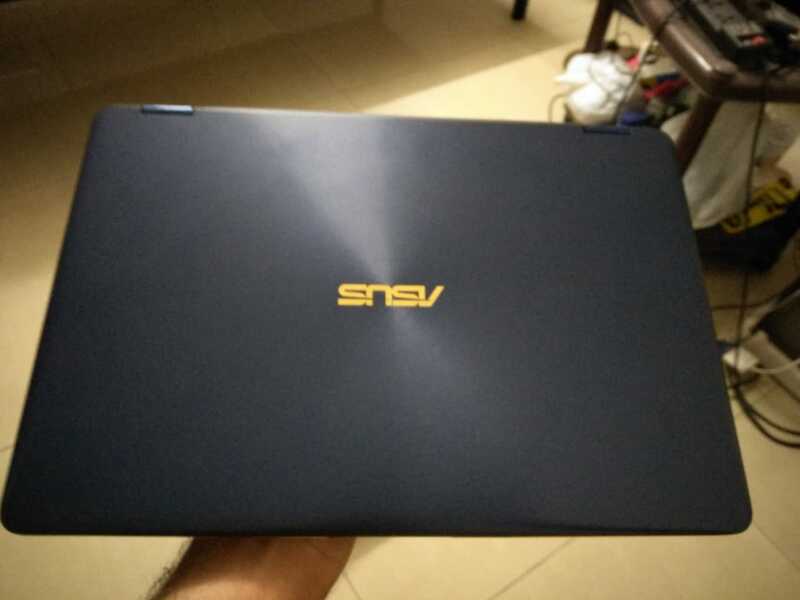 In this version Asus has updated latest processor in the market, the 8th generation Coffee-lake(i7 8th Gen) by Intel along with the usual top-end specifications from it's predecessor Asus ZenBook Flip UX360CA. 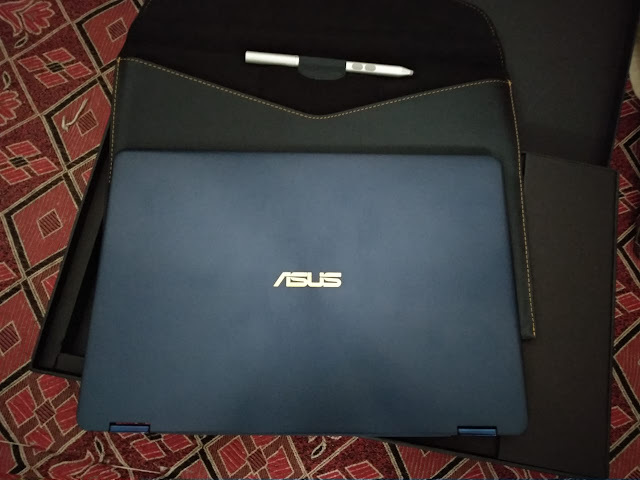 This ZenBook series is mainly made the professionals and content producing artist which require high end processing along with good touch screen support to make their life easy.The company priced the ZenBook Flip S (UX370) at Rs 1,30,990 and it is already available on sale at retailers across the country. Asus sent us ZenBook Flip S (UX370) that packs an Intel 8th generation Core CPU clocked at 1.8GHz with a turbo frequency of up to 4GHz. It also have 16GB LPDDR3 RAM and 512GB SATA3 SSD storage integrated inside it. The company claims that it is the lightest and thinnest convertible in the laptop industry with just 1.1 kilograms in weight. You might be thinking it is for the gamer, well not really Asus has packed Intel HD Graphics 620 which not suitable for mid or high end gaming. Yes you can play some low graphic casual games on this device. Beside with this powerful CPU it generates lot of heat which cooling fan can exert out from a single ventilation available on device. Beside this is mainly streamlined device for professionals and media content providers. Asus has added a 13.3-inch display with 1920×1080 pixels resolution and 16:9 aspect ratio. The display also comes with thin bezels, something that Asus called it as the NanoEdge design. The device comes with a convertible design that depends on that “360-degree hinge”. Device also works as tablet even you use it as laptop posture. It equipped with all connectivity options like Bluetooth, WiFi, USB type C. Even to out of the box it's charging itself have type C port as connector. ZenBook Flip S (UX370) comes with full-sized keyboard with backlit keys, and a large touchpad with glass, palm rejection, and Windows precision driver support. Asus have packed its dual Asus SonicMaster Premium stereo speakers that have been certified by Harman Kardon. It also comes with a 3.5-mm headphone jack, and a VGA web camera for video conferencing. 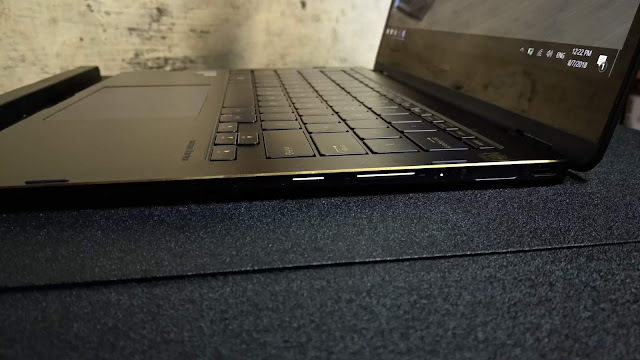 While ZenBook Flip S (UX370) being powered by a 39Wh 2-cell lithium-ion battery. The company seems to have awesomely design with the minimalist approach. ZenBook Flip S (UX370) have a mute blue shade along with a mix of golden accented finish running across the borders. The hinge is a bit different than what we have seen in other laptops but that has to do with the 360-degree convertible form factor. The 360-degree, tablet mode was flawless. I liked how the keyboard disabled itself when I switched to the tablet mode so that they don’t interfere with the operations. 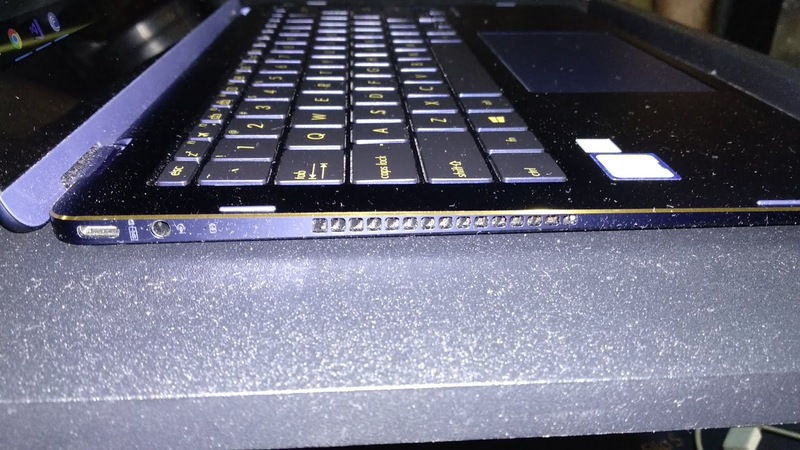 I did not find any problem with the design and came to appreciate small aspects such as the presence of power button, volume rocker, integrated fingerprint scanner, and a USB Type-C port on the right side along with the second USB Type-C port on the left side of the notebook so that users have the option to power the device through either of the two sides. The only problem with this device is USB ports are not available. But we have work around for it, we can use Type C OTG cable for the same if in case needed. Moving to the display of the notebook, it comes with a 13.3-inch display with Nano-deign that looks good. The display is touch capable so that you can use your fingers to interact with Windows to use the bundled stylus to ink, scribble, or draw especially when in the tablet mode. 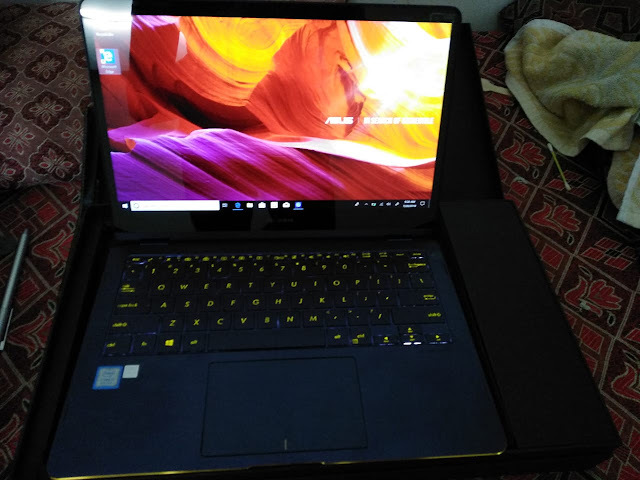 For processing front we have Intel i7(8th Gen) processor which handles daily task like surfing Internet and ZenBook Flip S (UX370) firepower to cover my daily work that includes about 7-8 hours of typing on a word processing program, 1-1.5 hours of streaming music all the while working on 8 to 25 tabs on Google Chrome at any given time. With 16 GB of RAM every software works smooth and flawlessly. Beside that you can also enjoy casual gaming like NFS Most wanted and NFS Carbon and POP. But while playing games we have to push processor to the max and that generate the ample amount of heat inside the device. But heat generated in the device at it's max load which only have way out at the left side ventilation to put it out. So you cannot play games much with this device. 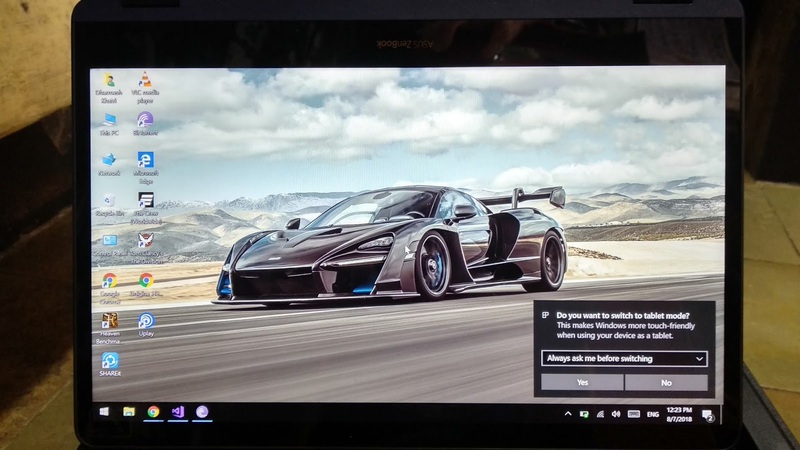 It also managed to handle the usual edits in Lightroom Classic or Adobe Photoshop CC while cranking the fan up to keep the system cool rendering anything complicated. The quality of webcam was borderline decent and Asus has packed bottom firing speakers with the device. This makes the Notebook fire all the sound it generates from the speakers downwards in order to make use of the surface below the device to reflect back the sound to the user. So this is guys. If you have any question about this device do let us know in comments below we will answer you for the same.